Spectacular Ocean Views for miles out. Even a rainy day in Laie brings beautiful rainbows to your view. Sleep to the roar of the ocean. Watch surfers and wind surfers from your window. Watch for the whales, turtles and sting rays swim by your window. Beautiful, private, sandy beach just across a small road to the beach access. This beach has white sand, blue water and very few people (often there are none at all!) You can be on this beach in 5 minutes, and walk for miles, jog, or sunbathe because it is yours right outside your door. 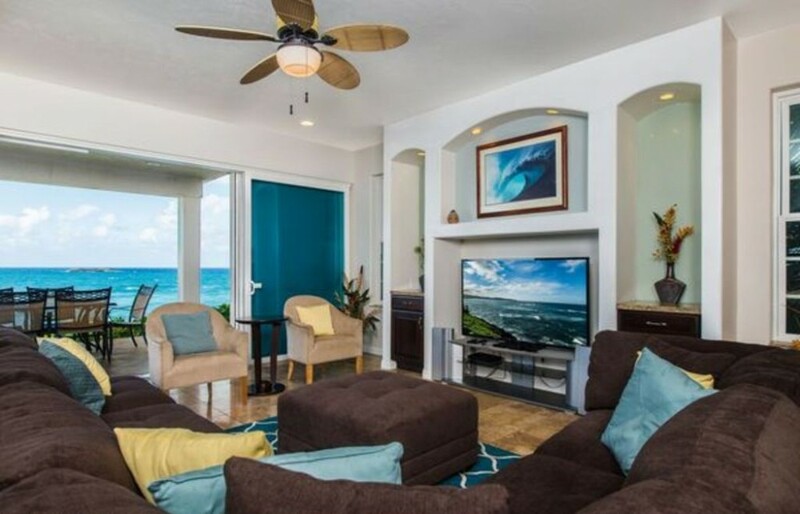 This luxurious, 3 bedroom, 3 1/2 bath duplex home built on a cliff on the ocean. Plenty of room to entertain, large, well-equipped kitchen, washer and dryer, marble floors, granite counter tops. great room with cable TV, living room with a grand piano, luxurious furnishings, and artwork. Wall of windows slide back to open the house up to the ocean and its breezes. One king bed, two queen, two twins and a sofa bed can sleep 11. Home is air conditioned in hot weather. This is a LUXURY for rentals in the area. Ceiling fans to circulate air. Private entrance, parking on site. Live ALOHA! Winter brings high surf to North Shore but Bikini Beach is swimmable year round. Walk to the end of Laie Point to see beautiful archways in the ocean. Hike to Laie falls. Horseback ride at Gunstock Ranch. Surf at Castle Beach, 3 miles from apartment. Amazing golf course at Turtle Bay 5 miles away. Multiple public beaches minutes away. The Polynesian Cultural Center is within walking distance. Five restaurants, movie theater, grocery store a short walk away. AMAZING location on the ocean and close to every activity.